1898, Trans-Miss., 1¢ dark yellow green, top sheet margin plate no. "592" block of 10 with imprint, o.g., never hinged, rich color, small selvage tear at top above imprint and some selvage discoloration at left, otherwise Very Fine. 1898, Trans-Miss., 4¢ orange, bottom sheet margin plate block of 10 with imprint, o.g., h.r. 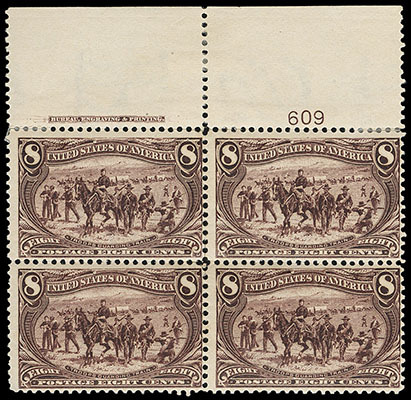 's affecting three stamps, others never hinged, deep intensely rich color, gum crease in bottom right selvage ending in reinforced break (not affecting plate block), otherwise Fine. 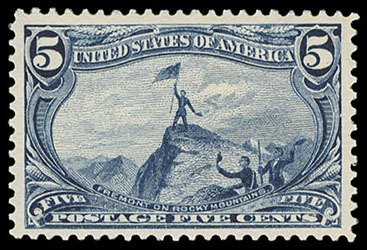 1898, Trans-Miss., 5¢ dull blue, o.g., never hinged, attractively centered amid wide well balanced margins, rich bold color and pristine freshness, Very Fine and choice; with 2001 P.F. certificate. 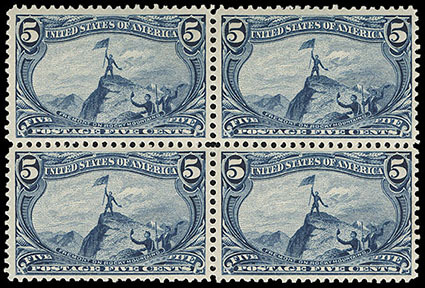 1898, Trans-Miss., 5¢ dull blue, block of 4, o.g., lightly hinged at top, bottom stamps never hinged, rich bold color, very fresh, Very Fine. Scott No. 288 $680 for singles. 1898, Trans-Miss., 8¢ violet brown, top margin plate no. "609" block of 4 with imprint, o.g., rich color	some reinforced perf separations, Fine. 1898, Trans-Miss., 10¢ gray violet, bottom margin plate no. "617" block of 20 with imprint, o.g., two stamps never hinged, strong bold color, some reinforced perfs, Fine. 1898, Trans-Miss., $1 black, bottom margin single with imprint, immaculate "P.O. fresh" o.g., never hinged, well centered amid wide margins, sharp detailed impression and deep color, Very Fine to Extremely Fine, a wonderful never hinged position single; with 2011 P.S.E. certificate Graded (VF-XF 85, SMQ $5,400). 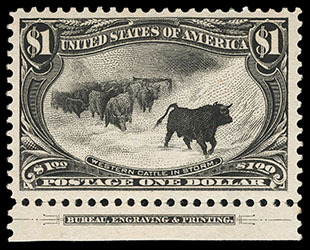 1898, Trans-Miss., $1 black, o.g., never hinged, wide margins, very fresh with rich bold color, Very Fine, a difficult high value to obtain in never hinged condition; with 1985 P.F. certificate. 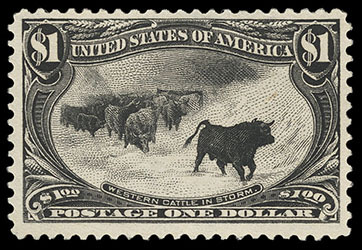 1898, Trans-Miss., $1 black, o.g., lightly hinged, large well balanced margins, bold color, Very Fine and choice; with 1985 P.F. certificate. 1898, Trans-Miss., $1 black, o.g., fairly light hinging, fresh with deep color, reperfed at right, Fine appearance.